Spray a large pan with cooking spray and preheat over medium/high heat. Add the bacon into the pan and cook until crispy, about 2-3 minutes per side. Blot the cooked bacon on a paper towel and set aside to cool. Spray a small pan with cooking spray and set to medium/high heat. Pour the liquid egg whites in a stir, like scrambled eggs, until lightly brown and cooked. Transfer to a plate to cool. Mix together the chopped lettuce and coleslaw mix, dividing evenly between two plates or bowls. Chop the tomato and divide it evenly between both bowls, arranging into a neat line on the far left side of the salad. Next, dice the green onions and arrange them in a row beside the tomato. Chop the chicken and arrange it beside the green onion. Following that, divide the feta evenly and align it in a row next to the chicken. Take your cool strips of bacon and crumble two pieces per plate in a row next to the chicken. Grab those cool egg whites, giving them a quick chop if they have all stuck together, and divide them evenly in a row beside the crumbled bacon. To finish it all off, chop the avocado and arrange it at the very end, next to the egg whites. In a small food processor, combine the Ranch dressing and Greek yogurt. Blend until smooth and well mixed. If the dressing is too thick for your liking, add water ½ a Tbsp at a time until the desired consistency is reached. 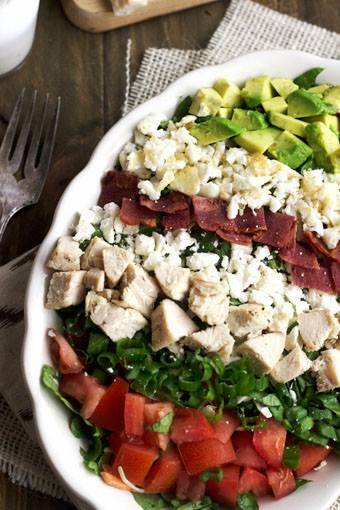 Drizzle the salads with the Ranch Greek yogurt dressing. This entry was posted in Blog and tagged healthy, high protein, low carb, low fat, recipe, salad. Bookmark the permalink.